Plants perennial (rarely appearing annual); cespitose, not rhizomatous, bases not hard and knotty. Culms 30-100(120) cm tall, 1-3 mm thick near the base, erect to decumbent. Sheaths rounded below, smooth or scabridulous, margins sometimes ciliate distally, apices with tufts of hairs, hairs to 4 mm; ligules 0.5-1 mm; blades (2)5-24 cm long, 2-4(6) mm wide, ascending or strongly divergent, flat to involute, glabrous abaxially, scabridulous adaxially, margins scabridulous. Panicles 10-30 cm long, 4-12 cm wide, longer than wide, open, subovate to oblong; rachises drooping or nodding; lower nodes with 1-2 branches; primary branches 1-8(12) cm, flexible, diverging at least 70° from the rachis, often strongly reflexed to 130° , tangled with each other and with branches from adjacent panicles, lower branches no longer than those in the middle, usually included in the uppermost sheath; secondary branches widely spreading, without spikelets on the lower 1/8-1/2; pulvini pubescent; pedicels 0.3-3 mm, spreading, scabridulous. Spikelets 1.8-2.5 mm, plumbeous. Glumes unequal, ovate, membranous; lower glumes 0.9-1.5 mm; upper glumes 1.4-2.5 mm, subequal to the florets; lemmas 1.4-2.5 mm, lanceolate to ovate, membranous, glabrous, acute; paleas 1.4-2.4 mm, ovate, membranous; anthers 0.4-0.7 mm, yellow. Fruits 0.6-1 mm, ellipsoid, light brownish to reddish-orange. 2n = 36, 38. Sporobolus flexuosus grows on sandy to gravelly slopes, flats, and roadsides in the southwestern United States and northern Mexico. It is associated with desert scrub, pinyon-juniper woodlands, and yellow pine forests. 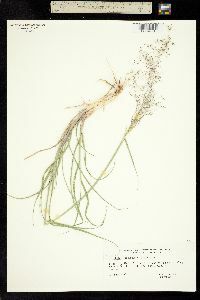 Its elevational range is 800-2100 m.
Common Name: mesa dropseed Duration: Perennial Nativity: Native Lifeform: Graminoid General: Tufted perennial grass, 30-100 cm tall; stems erect to decumbent, 1-3 mm thick at base. Vegetative: Blades 5-24 cm long, 2-4 mm wide, ascending to strongly divergent, flat to involute, lower surfaces glabrous, upper surfaces and margins minutely roughened; sheaths rounded below, smooth to minutely roughened, the margins ciliate above. Inflorescence: Panicle 10-30 cm long, 4-12 cm wide, longer than wide, the lower branches included in uppermost sheath; primary branches, secondary branches, and pedicels widely spreading; spikelets 2 mm, lead colored; glumes unequal, ovate, membranous, 1-2.5 mm; lemmas lanceolate to ovate, membranous, glabrous, acute; caryopsis ellipsoid, light brown to reddish orange. 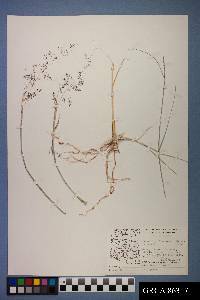 Ecology: Found on sandy to gravelly slopes, flats, and along roads in both dry and wet soils from 2,500-7,000 ft (762-2134 m); flowers June-October. Distribution: sw US, in CA and NV, east to TX, OK and KS; south to n MEX. 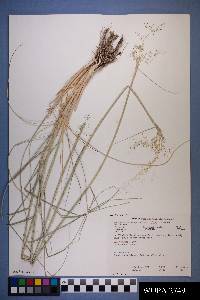 Notes: Sporobolus species have single-seeded spikelets with unequal glumes, no awns, and most often small seeds which readily fall after maturing hence the common name "dropseed." 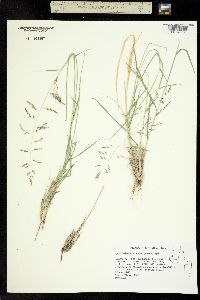 This species is most similar to S. cryptandrus but differs in the more open panicle, with widely spreading secondary branches and pedicels, and a drooping or recurving main axis. 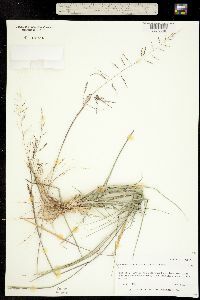 In S. cryptandrus, the panicle starts out contracted and spikelike, and opens over time; however, in that species the secondary branches and pedicels always remain appressed to the main branches. Also, the mature panicles of S. cryptandrus are pyramid-shaped, with the lower branches longer than the middle and upper branches. The panicles of S. flexuosus are oblong-shaped, with the lower branches the same length as the middle branches. Ethnobotany: Seeds used as food by various Native American groups; ground and mixed into a porridge, combined with with corn meal or used for flour. Synonyms: None Editor: SBuckley 2010, AHazelton 2015 Etymology: Sporobolus is Greek for "seed-caster," while flexuous means flexible.